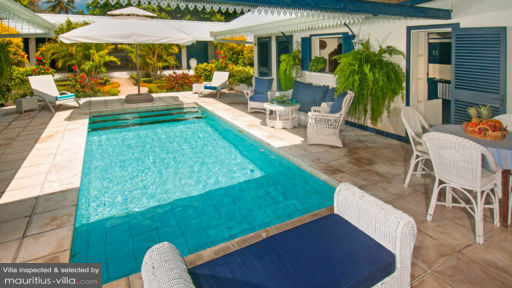 This luxurious beach villa is located in the popular beach resort district of Grand Baie. The centre, where you will find lots of shops, restaurants and a grand Bazar market, is just a 5 minute drive away yet within the villa, you will find total tranquillity and privacy. Port Louis, the islands capital, is a nice place to visit on a day-trip as it is just a 30 minute drive away. 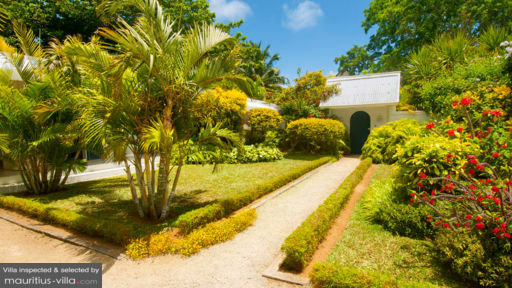 Villa La Belle Créole is surrounded by a beautiful lush green garden creating the perfect atmosphere for a wonderful holiday with your loved ones. In the heart of the estate lies a little patio that features a sparkling private swimming pool encompassed by a stone veranda with two sun-loungers for those wanting to catch a nice tropical tan and a table with chairs for dining alfresco style with food from the BBQ. 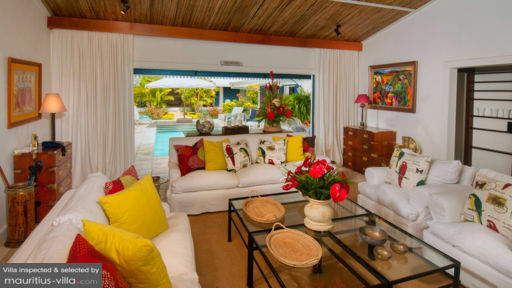 Inside living pavilion, the interior design is tropical and colourful with potted exotic plants, white walls, a sofa and a teak dining table. You will also have access to the nearest sandy shore and the azure blue ocean. The bedrooms are all air-conditioned and spacious, facing either the lovely lush garden or the stunning endless ocean. Each room has large wardrobe closets and a private en-suite. The master even boasts a bathtub to soak in after a long day of swimming and sunbathing. The office space can function as an extra bedroom for a child and there is also a baby-cot is also available. The maid will keep the villa clean and the cook will prepare you breakfast in the morning.